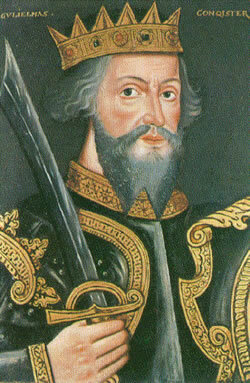 William the Conqueror (William I) is recorded to have come to Staffordshire in person during 1069 and 1070 in campaigns to stamp out rebellion. The force of this and general level of destruction was so great that large crowds of men, women and children wandered as far south as Evesham trying to scavenge food. William I is also known to have visited the shrine of Saint Modwen so certainly visited Burton and its Abbey. 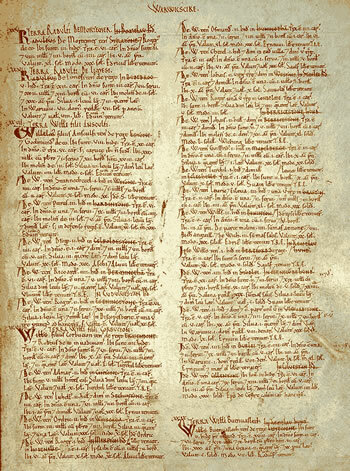 A survey later nicknamed and now commonly known as ‘The Domesday Book’ was compiled on the order of King William in 1086. In the Burton entry in the ‘Domesday Book’, it is wrongly entered as ‘Stafford’ instead of ‘Burton’ which led to some later confusion. 20 estates were bestowed in Staffordshire by Wulfic but only 9 of these are recorded in the survey. Despite the Abbey, Burton was actually recorded as smaller than Stretton. The Norman lords who accompanied William on the conquest of England were rewarded with land and title. The most significant beneficiary in the Burton area was Henry de Ferrers, who was given Tutbury castle in 1071. Another was Robert de Toeni whose son Nigel obtained Drakelow and Gresley. Royal commissioners visited each area and the inhabitants gave the information required in Old English although the final record was written in abbreviated Latin. Henry de Ferrers, of Tutbury castle, was one of the commissioners for Staffordshire. William’s principal aim in making the survey was to provide a complete audit of England for the purposes of tax assessment. It was also used as a land registry to record new rightful ownership which could be used to settle disputes of ownership that had arisen in the twenty years since the battle of Hastings in 1066. One unit of measure used in the ‘Domesday Book’ a ‘hide’. This was the amount of land that could be ploughed by a team of 8 oxen in a year and was equal to around 120 acres. A quarter of this was the ‘virgate’, and an eighth the ‘bovate’, which therefore, represented the amount of land that one ox could plough in a year and was around 15 acres. Aside from ‘The Domesday Book’ survey, two later surveys were made in 1114 and 1126 to record the Burton Abbey estates. These show record a class of persons known as ‘censarii’ or rent-payers. An example is William (of) Shobnall. He held two bovates of land for which William (of) Shobnall paid a rent of two shillings a year. Another example was Tintor, the dyer, who also paid a more expensive two shillings and sixpence for his two bovates and also had to adhere to an agreement to work his plough on the Abbey Demesne (home farm) twice a year and had to mow three times in August. In 1121, Ralph the ox-herd of Winshill had charge of four oxen and had to plough the Abbey Demesne. In return for this, held 8 acres of land. The later surveys suggest that as many as two thirds of the inhabitants of Burton were omitted from the Domesday survey, most likely due to deliberate evasion to avoid taxes. Another listed class of person was a ‘villein’. They were a class of medieval land tenants who held the legal status of freemen in their dealings with all people except their lord. A medieval village or manor usually contained several classes of laborers, consisting of in order of hierachy, the villein, the serf and peasant. There might be a number of freemen, who paid a fixed rent, either in money or produce, for the use of their land. Gradually the distinction between the villein and the serf disappeared. Most of the peasants were serfs or villeins. The serf and the villein laboured in the lord’s household or at work on his domain. Under feudalism the lords and nobles of the land had certain rights over Medieval Villeins which included the right of jurisdiction, which gave judicial power to the nobles and lords and the right of hunting. Among the local villeins listed in the early 12th century surveys was Alwin. He owed two day’s work on the Abbey Demesne every week. He also had to fetch salt once a year and fish on some occasions. At Christmas he had to bring a cartload of wood to the abbey and provide two hens, and during the year he had to make a ‘sester’ (large measure of malt) used by the monks for brewing, and fulfil various other obligations to pay for the right to graze his pigs. Other recorded groups of tenants on the Abbey lands were cottagers, working one day a week on the Demesne for their small plot of land, and oxen (usually one or two). In addition the surveys mention a number of skilled craftsman such as goldsmiths, dyers and masons, each of whom paid between sixpence and eighteen pence for a dwelling house with around half an acre of attached land. The two surveys suggest that in the early 12th century the arable Demesne land, which was scattered about the open fields in pieces called ‘flatts’ totalled about 500 acres within the manor of Burton. On the manor, the Abbey also had four oxen for drawing lime and four for drawing timber, one horse for harrowing, 70 mares and foals in the breeding stud, three Spanish asses, nineteen cows, one bull, eight heifers, two oxen not used for draught and 128 pigs. The total Burton population is estimated at about 60 households. The ‘Domesday Book’ mentions just nine villeins. The area of the Burton Demesne was limited by the fact that Burton was a town and Demesnes elsewhere on the Abbey estates, for example in Shobnall, were larger. Crops grown included wheat, barley, oats, rye, peas, beans and vetch. The Abbey was largely self-sufficent in food, the fertile soils of the river plain providing for both arable cultivation and cattle-rearing; the river provided fish and power for the water-mills, also listed, to grind the corn.